Books and Sensibility: #WeNeedDiverseBooks ! 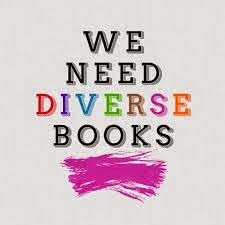 Conversations on diversity are happening all over the bookternet, but they all come down to one thing; we need more diverse books. The numbers in YA and kidlit are especially embarrassing, check out the numbers in this editorial from Walter Dean Meyers in the New York Times. Media does not exist in a vacuum and representation matters. And not just so readers can see themselves in books, but so readers can have experiences outside of their world view. Which is why I'm glad YA author, Ellen Oh, has started the we need diverse books campaign. The campaign rolls out in three phases which are listed here, but essential from May 1 -3 we want to make #weneeddiveresebooks trend worldwide. I hope everyone who comes across the blog does something to participate, even if it's just using the hashtag #WeNeedDiverseBooks or reblogging a post on Tumblr. Growing up as an avid reader I've always been aware of the lack of representation in novels. Yes, I love and relate to Sarah Dessen's books, but I also want to see books where black, Hispanic and Asian girls get to have romance or go on adventures. We deserve to be so much more than sardonic sidekicks, faint love interests, faithful best friends or tragic inner city youth. We need diverse books because our heroes and heroines come in all shades. At Books and Sensibility we are also challenging ourselves, last year 20 percent of our reviews featured books with POC as side or main characters, this year we want to get closer to 50 percent. To help open up the door and showcase some books you may not know feature diversity, I've compiled a short list of books we've either read or want to read. What are some of your favorite books by authors of color or with protagonist of color ? Please share !